The Stone Pond is a complete system to store, use and maintain water stones up to 305 mm long. Stones can be stored, ready for use, in a stand that also clamps them and provides a base for lapping. The twin-clamping system holds both coarse and fine stones at the same time and the quick-acting cam clamps are fully adjustable. There is ample space for three or more bench stones. Stones are kept clean and evaporation is minimized. The clamp hardware is stainless steel, anodized aluminum, and glass-reinforced plastic. The tough, rigid ABS case has high-friction pads for non-slip use. The lapping system is a glass plate, a sheet of PSA-backed plastic laminate, and 90 gritz silicon carbide. The safety-glass top is guaranteed to be flat enough to allow you to lap a stone to a flatness better than 0.001" per inch (0.03 mm) of stone length. You can put your coarse stone (800, 1000 or 1200 grit) in the water and leave your wooden-based finishing stone (4000, 6000 or 8000 grit) clamped on a bar. For stones sitting in the water, ribs on the box bottom keep them clear of any sludge. 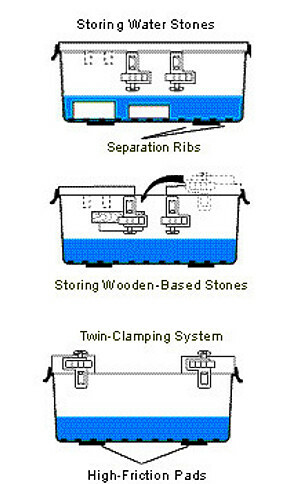 The clamping and lapping part of the system can be used equally effectively with oil stones. 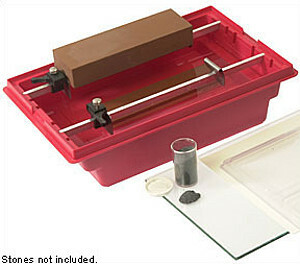 This is a fast, clean, dependable system for use with all of your bench water stones. Note: Please check first whether your waterstones are suitable for permanant storage in water! A very useful device even if you do not store your stones in water permanently!